Please use this form to help the group help ID any coins you are having trouble attributing. 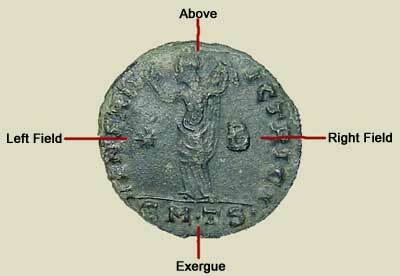 We are testing this out as a tool ACE can provide to students to help id ACE coins. If you have suggestions on how this form may be improved, please contant Kevin or Mark. Directions: Simply fill this form out as completely as you can and submit it. A e-mail will be sent to the group from coin_id_help. It will contain the info you enter on this form, giving the attributionist (if there is such a word!) the details to help. Other than the inscription, are there any letters or symbols in the feilds? In the below example we have a STAR in the left field, a B in the right field, the above field is empty, and the exergue contains SM (dot)TS(dot). Unfortunately, at this time, there is no way to enter Greek characters. Until we can figure out a way (if you have an ideas E-MAIL US) here is how we will handle it.